The best horror comes from the tense intermingling of expectation and inevitability. We know that something bad will happen. We anticipate it, waiting for the moment of revelation, when the narrative strips itself bare and shows us its hideous underbelly. Choice is a particularly effective mechanic for increasing the horror of inevitability. Think of a video game like Silent Hill 2. The monsters are always there, always waiting. In order to progress the narrative, the player must confront them. But in order to confront them, the player must press buttons, must move the character forward. It can be terribly tempting to hold back, to run away, but inevitably the player must make the decision to engage with horror of their own free will. This heightens the tension and anticipation, and makes the horror feel more vivid. But player choice is also the problem with games as a medium for horror. The nature of games demands a fail state as well as a win state. A game is challenging because you can lose, whether that’s dying to a boss or filling up the screen in Tetris. However, in most games, only the win state is valid. There is only one true way to overcome obstacles and complete the narrative, and this forces repetition on the player. Face the monster over and over again, watch yourself die enough, and it stops being scary and becomes a pattern, an obstacle to overcome. Even Pyramid Head, the notoriously unnerving monster from Silent Hill 2, is eventually reduced to a mundane enemy through repetition. Emily Carroll, best known for webcomics like Margot’s Room and her graphic novel Through the Woods, was co-creator of the short indie game The Yahwg, and although The Yahwg is not a straight horror game, there is a tension between choice and inevitability in it that is similar to good horror. It explores the lives of four characters in the days leading up to a cataclysmic storm called the Yawhg. The player chooses which area of the town to send the characters to and sometimes gets to make choices about what they do while they are there. 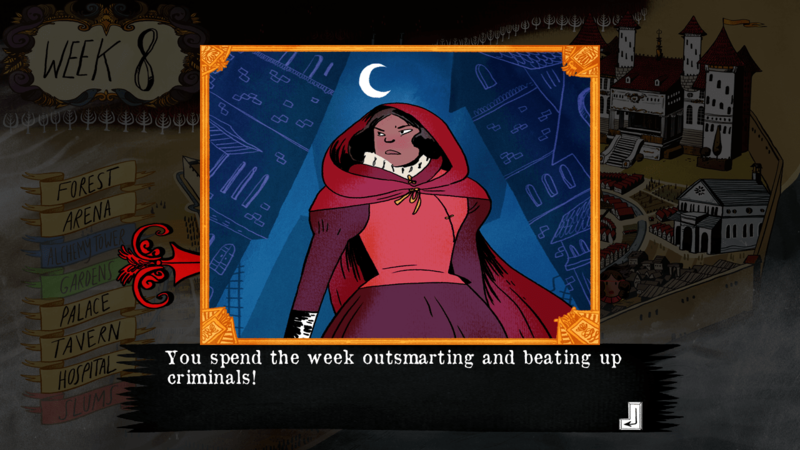 Then, after the Yawhg arrives, the player gets to see how those choices affect the characters’ futures. Restricted choice drives the narrative, and what seems like a good idea before the storm does not always play out well for the different characters involved. This understanding of choice and agency in horror narratives is something she has also explored over the course of her webcomic career. Emily Carroll hosts six stories on her site listed as horror, plus one marked as a ghost story and a mystery, all produced between 2010 and 2014. Over the course of these narratives there is visible development, as Carroll plays with the digital space available to her, explores the potential to draw a reader into a story as an active agent, and force them not just to passively read the narrative, but to make a choice to confront it. Even in her earliest comic, His Face All Red, we can see her developing a style that challenges the reader’s expectations. 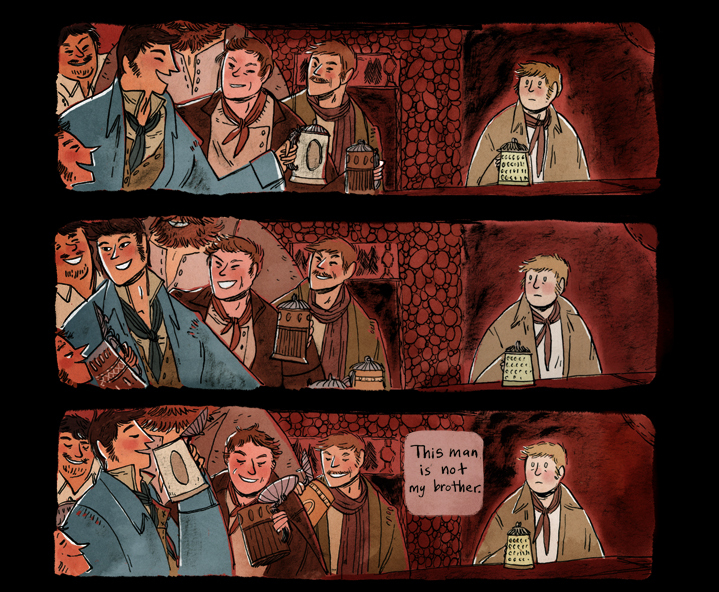 The comic is lush and colourful, but is presented against a stark black background. Unlike other webcomics, there is no border, no author text at the bottom of a page, no space for comments, and no advertisements. Each page is long: much, much longer than a printed page, so that scrolling down it leaves the reader with a sensation like descending into a deep, cold well. This non-traditional design is disorienting, leaving the reader without a sure guide of what will happen where and when. The reader’s expectation is challenged, and their uncertainty increases the tension. The expansion and contraction of the panels, almost as though the story is breathing, also adds to this effect. At the very end of the story, the panels become a literal hole, a long depiction of the main character’s descent into a pit. This literalisation of the metaphorical location of the story is a warning that the end of the story is near. At the bottom, when the reader clicks the next button, they are presented not with a long series of panels, but one with the next button directly below it. The digital space shifts to represent the bottom of the pit and the end of the story. This use of digital space makes the reader an explorer. In the early part of the story, it’s possible to scroll up and down the long pages, to return to an earlier panel and check something. But as the story reaches its conclusion, the reader is hemmed in, and their choice to move forward is made more plainly evident. No longer do they have the safety of a wide narrative space. They must confront the horror at the bottom of the pit directly. Margot’s Room, made directly after The Prince and the Sea, incorporates elements from both of the earlier comics, but it adds elements that force reader choice more directly to the surface. When the reader clicks on the story they are taken to a title page, with an ominous picture and words that describe the overall narrative arc of the comic. These five lines form key words that the reader must use to find each part of the story. The parts are accessed by clicking on different parts of the image, and though most are obvious, the reader must still make the connection for themselves, and then make the choice to click. This simple removal of guidance changes the relationship between reader and text. Suddenly, the piece becomes something that the reader must think about and decide on. And though a point-and-click interface may seem simple, it is a fundamental element of game design. 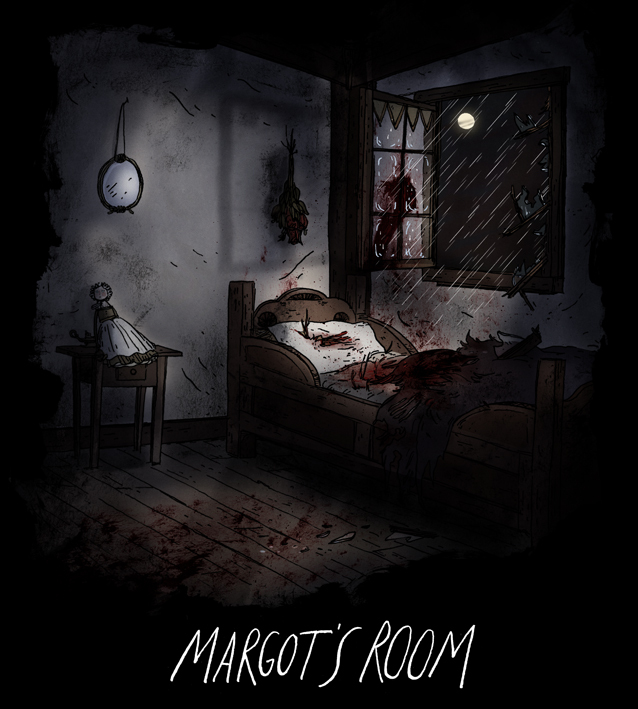 This is not to suggest that Margot’s Room is a game. Unlike a game, there is no balance between fail states and win states, no good or bad endings for the reader to work towards. However, by forcing the reader to navigate through the digital space of the narrative with only clues to guide them, the story becomes a kind of investigation, and thus the choice to uncover the horror of the ending is reinforced. Like a game, player agency becomes crucial to the unfolding narrative. The reader must confront the tension between curiosity and fear to move forward. The individual pages reinforce this. The first and the third part scroll vertically, while the second and fourth scroll horizontally, and the fifth scrolls in both directions, presenting small panels in a huge black void, like a trail of breadcrumbs leading the reader through dark woods. At the end of parts one to four, the reader is presented with a link back to the title page in the form of the words “return home.” Everything in the narrative centers around the image of the titular room, dark and shadowy, with blood on the floor and the window open to the rain. The final part leads us there too, and at last shows, us what was hiding in the shadows. The use of hyperlinks and digital space is supremely effective in Margot’s Room, because it reinforces both the tone and theme of the story. The construction of the narrative is just alienating enough to make the reader feel off balance and doubt themselves, which helps to align the reader’s emotions with those of the narrator, who is also alienated by the changes in her husband and the loss of her daughter. Furthermore, because the story is essentially told in flashback and the reader returns to the end between each part, the idea that this is a story of grief and loss is emphasized. Objects become totems of memory, fragments of a past life to be fixated on after the person they represent is gone. Like the narrator, the reader wanders back through her life, looking for a moment when things might have changed, when they might have been different, and as they read they come to understand that there is no such moment. The horror is always inevitable, and the reader confronts this when they click back to the title screen at the end of each part. 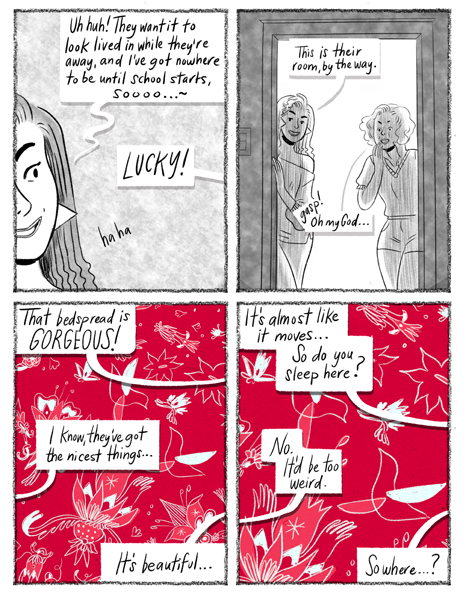 Of all Emily Carroll’s work, Margot’s Room most directly intersects with the idea of reader choice and the inevitability of horror, but in her later comics she develops similar themes in more subtle ways. Out of Skin returns to the vertical plunging narrative of His Face All Red, and the focus in the comic is on the dynamic use of red in contrast with more muted colors. For someone used to Carroll’s work, the digital space of Out of Skin is familiar, at least until the final page. Out of Skin mark’s Carroll’s first use of GIFs as part of a horror comic, and the effect, which implies multiple layers of reality or multiple perspectives stacked together, is remarkably effective and chilling. The Hole the Fox Did Make, though marked as mystery rather than horror, has a highly unnerving narrative with a chilling ending. For the most part, the comic is presented as a series of black-and-white four-panel strips, which feel closer to a normal webcomic than any of her previous work. There are back arrows as well as forward arrows, and a from the beginning link in the middle. There is also a header drawing at the top of the page. This dynamic explodes when the climax comes and the mystery is revealed. The page opens up and a long series of panels incorporating red, as well as black and white, are set before the reader. This expansion demands exploration from the reader, and they must move through the page to uncover the answer to the central mystery of the story. The past, which shapes the tragedy of the narrative, intrudes as a violent and messy clot into the sedate pace of the story, an aggressive overturning of the “rules” of the narrative, which lays bare the ugly actions the characters have enacted on each other. Carroll’s two most recent comics show a sophisticated approach to the techniques she has developed to explore digital spaces. All Along the Wall, the shorter and most recent of the two, distinguishes between the “real” space of the comic, which takes place in the empty black background reminiscent of her earlier work, and a children’s story framed against a white background and drawn in bright primary colors. This shift from black to white and back again disrupts the space of the narrative and makes the reader aware of the webpage as a space—a potentially threatening one. When the black background returns, it seems less neutral and more sinister, a cave of shadows in which monsters may appear. When the Darkness Presses is Carroll’s most elaborately constructed narrative to date, even more elaborate than Margot’s Room, though in a much more subtle way. It eschews the narrative knot that is the title page of Margot’s Room in favor of shifting spaces that challenge the reader to consider what they are seeing. The comic begins with an image of a door, visible against a black background. Clicking on it takes the reader to a webpage which looks very similar to most other online comics. The title of the comic is at the top, with the update schedule. Underneath there are three banner ads that flash between two images, and in the middle a page of the comic, drawn in black and white. It takes a moment to realise that the ads are drawn by Emily Carroll, and advertise products that do not exist. The whole webpage feels completely familiar to anyone interested in webcomics, and so it is possible that a reader may not immediately recognize how strange it is. When the narrator of the comic begins telling a story about a dream, the comic returns to Carroll’s more familiar style, a vertically scrolling series of images against a black background. Like the earlier pages, this is drawn primarily in black and white, with accents of color (mostly red). There are also GIFs, words that move and shift across the page to convey a sense of time and terror. The “next page” link at the bottom is no longer a simple arrow but an image of a door, like the one that first led the reader into the comic. When the Darkness Presses continues to shift back and forth between the webcomic style and Carroll’s usual style, with one style for nights and one for days. This shift reinforces the horror, and it creates a sense of anticipation for the reader, who waits for each shift to come. The two parts of the comic are linked by the narrator’s speech, but they are also linked by a dark pink bedspread, covered in detailed drawings of flowers and insects, which appears in both sequences. From the very first time we see it, the bedspread feels out of place, a disruptive element in the calm black and white world of the comic. Even more visually arresting than the red dialogue and highlights of the dream sequences, the bedspread slowly entangles itself with the fear lurking at the center of the narrator’s world. Then, as the comic progresses, the bedspread’s pattern appears in the banner advertisements framing the comic. The boundary dissolves between the story and the page, leaving the reader less than certain of what other boundaries are being maintained. 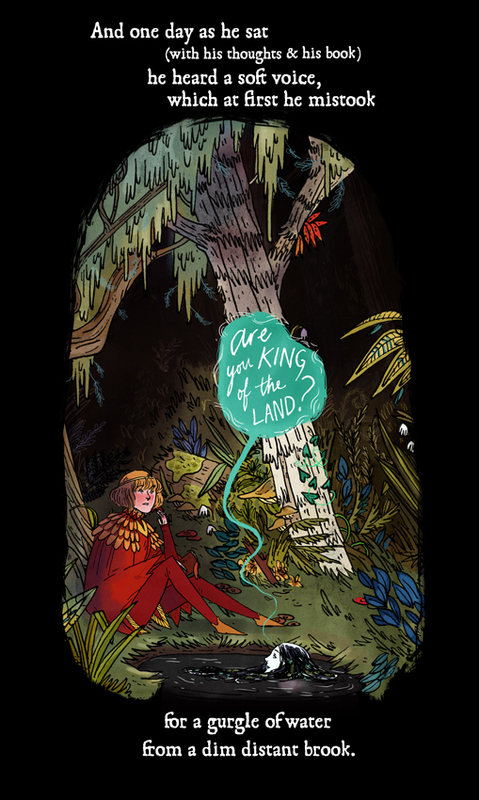 When the story returns to the dream world, the “next” button is again a door, but this time it is open, and moving through it the reader is taken to a page that scrolls horizontally, a dream in which the gray-scale narrator moves through a lush and colorful forest, reminiscent of the detailing on the bedspread. These shifts, and then the shift to the final page, where the banner ads return, set against the black background of the dreamscape and flashing between inane ads and visions of horror, leave the reader without a map. The digital space of the comic is completely destabilized. Though Margot’s Room is more game-like, at least a first glance, When the Darkness Presses feels like a more authentic examination of the tension between choice and inevitability. The narrative is more singular, without even the possibility of reading the parts out of order, but it highlights reader exploration in a more complex way. The reader must make a choice to see patterns and boundaries, to recognize what the story is trying to say as it says it. They must navigate through Carroll’s strange spaces, waiting for the moment when the monster steps through the door. And even when the horror is revealed, she leaves the reader without resolution. [pullquote]And even when the horror is revealed, she leaves the reader without resolution. [/pullquote] The narrative asks you to read around it and beyond it, to guess at the narrator’s choices and fears. The reader is granted far more agency in When the Darkness Presses than in Margot’s Room, because it is only through their thought and exploration that a coherent narrative truly emerges. Carroll’s work is fascinating on many levels. She is highly focused on women’s narratives and on the relationship between gender and horror and violence. Her stories have a fairy-tale quality to them, but these are old fairy-tales, and the blood and bones are uncovered, carrying a warning to the reader. 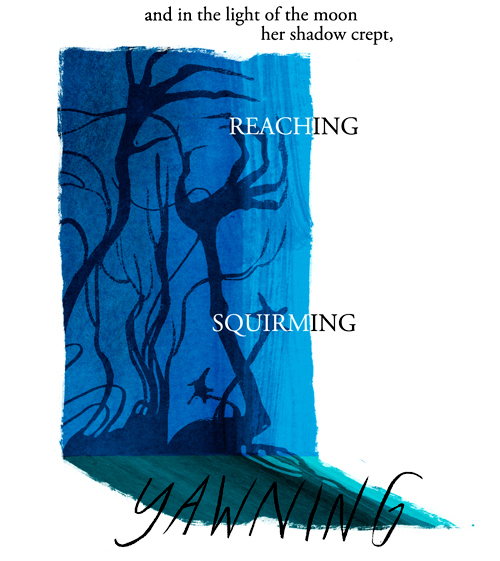 There is much that can be said about her work on a narrative level, but it is certainly true that her masterful use of digital space allows her to present horror in a supremely effective format. Wow, this is a great article, For someone like me who doesn’t really do webcomics it communicates the complexity and fascination of the medium. I’ll be going in search of Emily Carroll . . .